Caldo, Joseph J. "Cowboy life as reflected in cowboy songs." Western Folklore. 6: 335-340, 1947. Caldwell, Mable. "Gleanings from the by-ways of Oklahoma folk lore." Chronicles of Oklahoma. 4(1): 45-49, March 1926. ?Content "My love is a rider." California songster, containing a selection of California and other popular songs. San Francisco, CA: D.E. Appleton Co., 1855. * "Camp songs: Hi Yo Witz Ee; I'd rather; San Domingo [tune: Madadlay]." El Palacio (Santa Fe, NM). 33(9/10): 110-111, August 31- September 7, 1932. Camp songs 'n things: music-stuntz-phun and the melodies of the lyrics in 'camp songs'. Berkeley, CA: Zander & Klusmann, 1939. 119 p.
'talking things over', Western Canada." Campbell, Olive Dame; Sharp, Cecil J. English folk songs from the southern Appalachians. / Olive Dame Campbell and Cecil J. Sharp. New York: G.P. Putnam's Sons, 1917. * Campbell, Walter S. [Stanley Vestal]. The book lover's southwest: a guide to good reading / Walter S. Campbell. Norman, OK: University of Oklahoma Press 1955. 287 p.
See: ch. 15 "Poetry and song", p.218-233. Campbell, William Carey. A Colorado colonel: and other sketches / William Carey Campbell. Topeka, KS: Crane and Co., 1901. * Candles in the night: autographs in verse by one hundred members, past and present, of the Poetry Society of Colorado. Denver, CO: Poetry Society of Colorado, 1936. 110 p.
Easter greetings (poems) from the Hafens [Ann & Norma Hafen] pasted in back. 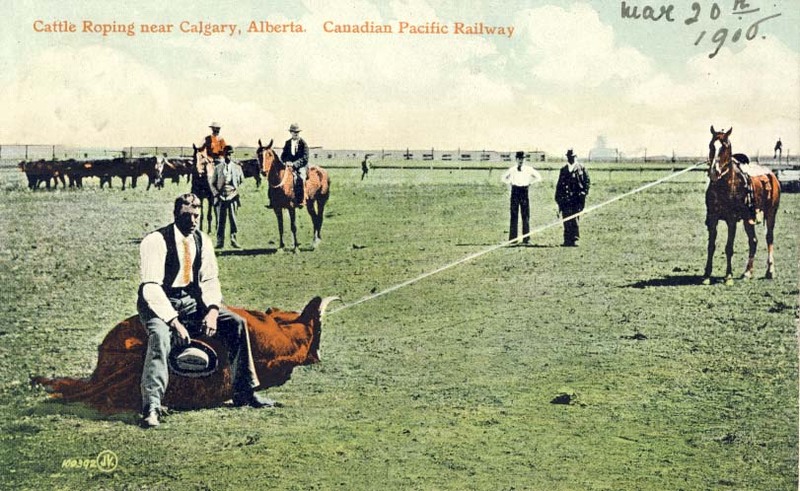 "Cattle roping near Calgary, Alberta. Canadian Pacific Railway." Cannon, Cornelia James. The fight for the pueblo / Cornelia James Cannon. Boston, MA: Houghton Mifflin, 1934. Cannon, Hal. 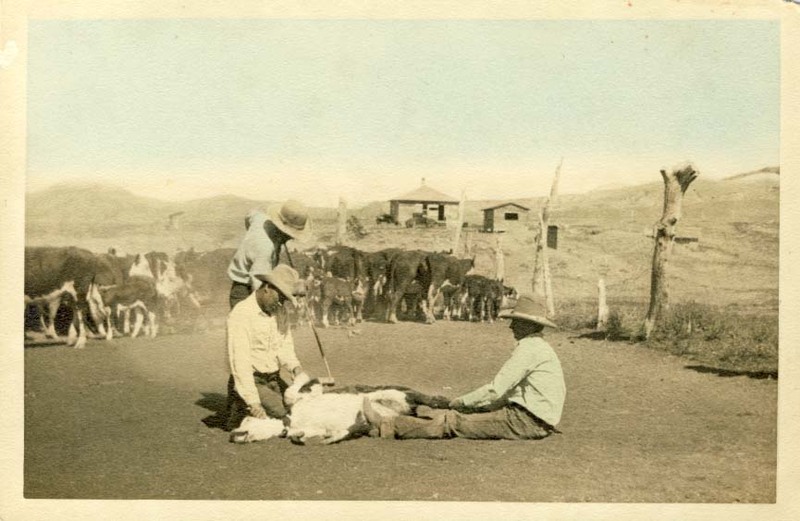 "Cowboy poetry: a poetry of exile." p.62-70. In Cowboy poets and cowboy poetry. Edited by David Stanley and Elaine Thatcher. Urbana, IL: University of Illinois Press, 2000. Caress, Jay. Hank Williams: country music's tragic king / Jay Caress. New York: Stein and Day, 1979. 253 p. Ill.
Hank Williams (1923-53), see index "Drifting Cowboys." * Carlin, Richard; Carlin, Bob. Southern exposure: the story of southern music in pictures and words. / Richard Carlin and Bob Carlin. Foreword by John Hartford. New York: Billboard Books (Watson-Guptill Publications), 2000. 160 p.
Mostly on the music of the American south with references to the popularity of cowboy and Hawaiian music. 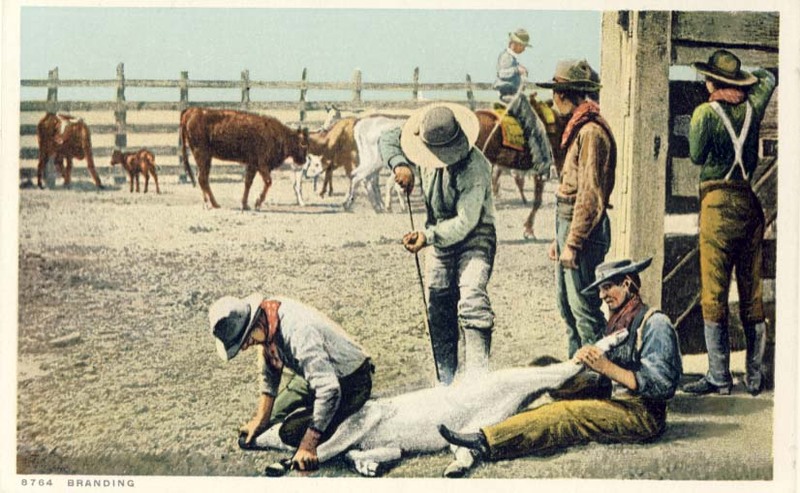 "Canadian North West roping cattle." Carlisle, Irene Jones. "Fifty ballads and songs from northwest Arkansas" / Irene Jones Carlisle. Master's thesis. University of Arkansas, 1952. Carlson, A. D. "Cowboy ballads at our own firesides." Better Homes and Gardens. 10(23): 61-62, November 1931. Carr, Robert V. Black Hill ballads / Robert V. Carr. Denver, CO: Reed Publishing, 1902. * Carr, Robert V. Cowboy lyrics / Robert V. Carr. 2nd ed. Chicago, IL: W. B. Conkey Co., 1908. 182 p.
"[3 men branding] George Torew ?, Claude and Carl Holland." Hand-tinted photograph; men identified on back, no place, no date. Carr, Robert V. Cowboy lyrics / Robert V. Carr. Roundup edition. Boston, MA: Small, Maynard & Co., 1912. Carr, Robert V. "Love lyrics of a cowboy." Sunset Magazine (Los Angeles), 1910. Carson, Bob A. Poems of American cowboys and nature / Robert A. Carson. np: B. Carson, 1938. Carter, Kate B. "Songs composed and sung by the western pioneers." In Heart Throbs of the West (Salt Lake City: Daughters of the Utah Pioneers). 5: 493-532, 1944. Carter, Wilf (Montana Slim). Songs of the plains and Rockies / by Wilf Carter. New York: Southern Music Publishing, 1941. 64 p.
* Carter, Wilf. The yodelling cowboy: Montana Slim from Nova Scotia / Wilf Carter. Toronto, ON: Ryerson Press, 1961. 104 p.
* Carvings on the aspens: a collection of prose and poetry by the Sublette County Artists' Guild. With drawings by Betty Blake. Denver.CA: Big Mountain Press, 1956. 151 p.
"Cowboys bed room, Western Canada." The Maple Leaf Forever / C.T. Photochrom. * Casey, Pearle R. Facing West / Pearle R. Casey. Caldwell, ID: Caxton Printers, 1936. 77 p.
Catch-pen: a selection of essays from the first two years of the National Cowboy Symposium and Celebration. Ed. by Len Ainsworth and Kenneth W. Davis. Lubbock, TX: Ranching Heritage Center, Texas Tech University, 1991. 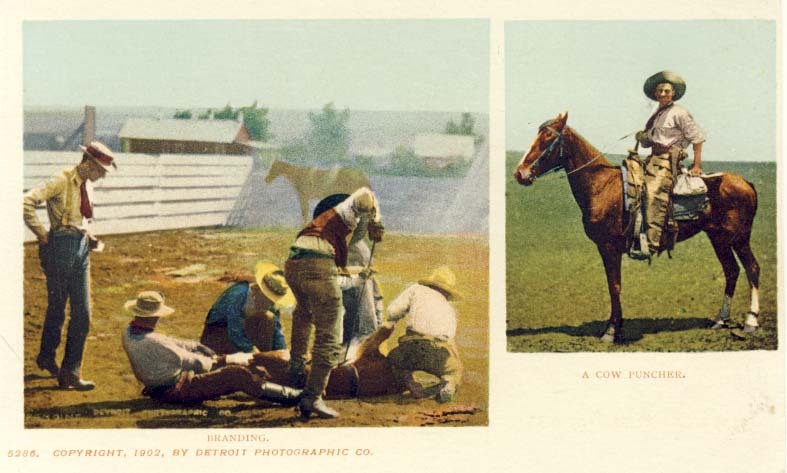 233 p.
Cattle, horses, sky, and grass: cowboy poetry of the late twentieth century. Edited by Warren Miller; illustrated by Joe Beeler. Flagstaff, AZ: Northland Publications, 1994. 212 p.
Centennial songs of Texas. Edited by Virgil O. Stamps. Dallas, TX: Stamps-Baxter Music, 1936. A century with Texas poets and poetry. Edited by Vaida Stewart Montgomery. Dallas, TX: Kaleidograph Press, 1934. Chapman, Arthur. Cactus center / Arthur Chapman. Cambridge, MA: Houghton Mifflin, 1921. * Chapman, Arthur. Out where the west begins: and other Western verses / Arthur Chapman. Cambridge, MA: Houghton Mifflin, 1917, c1916. p.
The Chapman poem "Out where the west begins" was set to music by Estelle Philleo. * Chapman, Arthur. The story of Colorado: out where the West begins. Illustrated by Will Crawford. New York; Chicago: Rand McNally and Co., 1924. 270 p.
See poem "Out where the West begins," p. 11. Chapple, Joseph. Heart songs, dear to the American people / Joseph Chapple. Boston, MA: Chapple, 1909. Chase, Gilbert. America's music: from the Pilgrims to the present / Gilbert Chase. New York: McGraw-Hill, 1955. 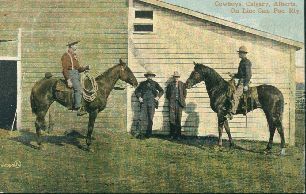 "Cowboys, Calgary, Alberta, on line Can. Pac. Rly. [Canadian Pacific Railway]"
Chavez, Fray Angelico (1910- ). Clothed with the sun / Fray Angelico Chavez. Santa Fe, NM: Writers' Editions, 1939. 49 p.
See: "Singing cowboy" p.34; "South western night" p.37. Chavez, Fray Angelico. Eleven lady lyrics and other poems / Fray Angelico Chavez. Patterson, NJ: St. Anthony Guild Press, 1945. 96 p.
* Cheney, Ethel B.(1882-1941). New language: a book of poems. Albuquerque, NM: Morton Mead Cheney, 1941. 86 p. Edition of 250 copies. See: "Here in New Mexico," p.50-53. Cheney, Thomas E. "Bringing the desert into the blossom." Utah Music Educator. 8(3): 9-15, Fall 1963. Cheney, Thomas E. "Folk ballad characteristics in a modern collection of songs" / Thomas E. Cheney. Thesis. University of Idaho, Moscow, 1936. Mormon songs. Cheney, Thomas E. Mormon songs from the Rocky Mountains / Thomas E. Cheney. Austin, TX: University of Texas Press, 1968. 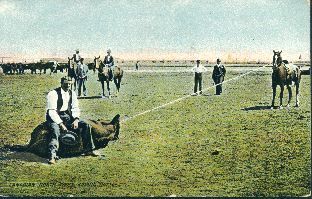 "Cowboys toasting their shins, Western Canada." * Cheyney, Ralph. Selected poems / Ralph Cheyney. Edited by Lucia Trent. San Antonio, TX: Carleton Pub., 1942. 39 p.
* Chisholm, Alexander. The old Chisholm Trail: life line of the Great Plains / Alexander Chisholm. [Edited by Kathryn Kay]; illustrated by Jim Pratt. Salt Lake City, UT: Handkraft Art and Publishing, 1964. 584 p.
Chittenden, Larry. "The cowboys' Christmas ball." Dallas Morning News. December 27, 1891. Chittenden, Larry. "The cowboys' Christmas ball." Galveston Daily News. December 27, 1891. Chittenden, Larry. "The cowboys' Christmas ball." Texas Western. June 19, 1890. Chittenden, William Lawrence. Ranch verses / William Lawrence [Larry] Chittenden. New York: G.P. Putnam's Sons, 1893. 189 p.
* Church, Peggy Pond. Accidental magic / Peggy Pond Church. Albuquerque, NM: Wildflower Press, 2004. 144 p. Signed by Kathleen Church. Church, Peggy Pond. Familiar journey / Peggy Pond Church. Sante Fe, NM: Writers' Edition, 1936. 69 p.
Church, Peggy Pond. Foretaste / Peggy Pond Church. Sante Fe, NM: Writers' Edition, 1933. 73 p.
* Church, Peggy Pond. The ripened fields: fifteen sonnets of a marriage. Sante Fe, NM: The Lightening Tree, 1978.  p. 2nd printing 1985. * Church, Peggy Pond. A rustle of angels. Illustrated by Jeannie Pear. Denver, CO: Peartree Press, 1981. 20 p.
Detroit: Detroit Publishing Co., [193-] Phostint. 8764. Church, Peggy Pond. Ultimatum for man / Peggy Pond Church. 2nd ed. Los Angeles, CA: Stanford University, 1947, c1946. 32 p.
* Clancy, Fog Horn. "The cowboy's lament." JE Ranch Rodeo: official program. [Waverly, NY: JE Ranch, 1947]. p..
* Clapp, Frederick Mortimer. Against a background on fire, 1938-1943 / Frederick Mortimer Cla p. New York; London: Harper & Brothers, 1943. 154 p.
* Clark, Axton. The single glow / Axton Clark. Santa Fe, NM: Villagra Press, 1933. 133 p.
This Clark seems to be the same Donald [Douglas] Clark who was involved in a suppressed homosexual purge at Harvard University in the 1920s. Clark, (Charles) Badger. "The glory trail." Pacific Monthly. 25(4): 355-356, April 1911. Clark, Badger. Grass grown trails / Badger Clark. New York: Gorham Press, 1917. Clark, Badger. "In Arizony." Pacific Monthly, August 1906. 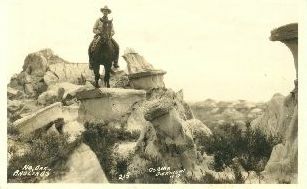 Changed title to "Ridin" in 1915. Clark, Badger. Sky lines and wood smoke / Badger Clark. Custer, SD: The Chronicle Shop, 1935. 2ndprinting. 75 p.
Clark, Badger. Sky lines and wood smoke / Badger Clark. Custer, SD: Badger Clark Memorial Society, 1991. * Clark, Badger. Sun and saddle leather / Badger Clark. Illustrations from photographs by L.A. Huffman. 3rd edition. Boston: Richard G. Badger (The Gorham Press), 1919, 1917, 1915. 92 p.
Clark, Badger. Sun and saddle leather / Badger Clark. Illustrated by L.A. Huffman. Boston, MA: The Gorham Press, 1922. Clark, Badger. Sun and saddle leather / Badger Clark. Boston: Chapman and Grimes, 1942, c1936. * Clark, Badger. Sun and saddle leather: a collection of poems / Badger Clark. Illustrated by Edward Borein. Stockton, CA: Westerners Foundation, affiliated with University of the Pacific, 1962, c1915, 1917, etc. 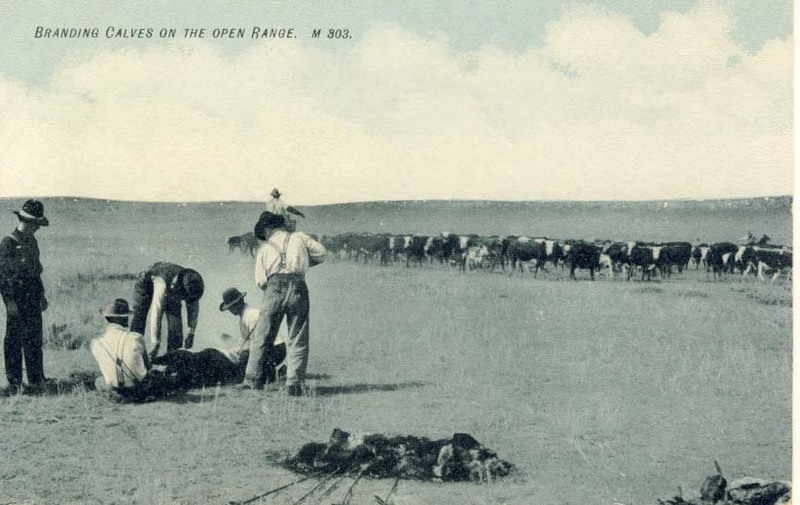 201 p.
"Branding calves on the open range." * Clark, Badger. Sun and saddle leather: including "Grass grown trails" and new poems / Badger Clark. Illustrated by L.A. Huffman. Boston, MA: R. G. Badger (Gorham Press), c1920, 1919, 1917, 1915. 7 plates 221 p.
And feel his knee rub mine the same old way. He's dead -- and what that means no man kin tell. Some call it "gone before." * Clark, Frank M. Sandpapers: the lives and letters of Eugene Manlove Rhodes and Charles Fletcher Lummis / Frank M. Clark. Santa Fe, NM: Sunstone Press, 159 p.
See "At twilight," p.142, from A bronco pegasus. Clark, Kenneth S. The cowboy sings: songs of the ranch and range / Kenneth S. Clark. New York, Paull-Pioneer Music, 1932. 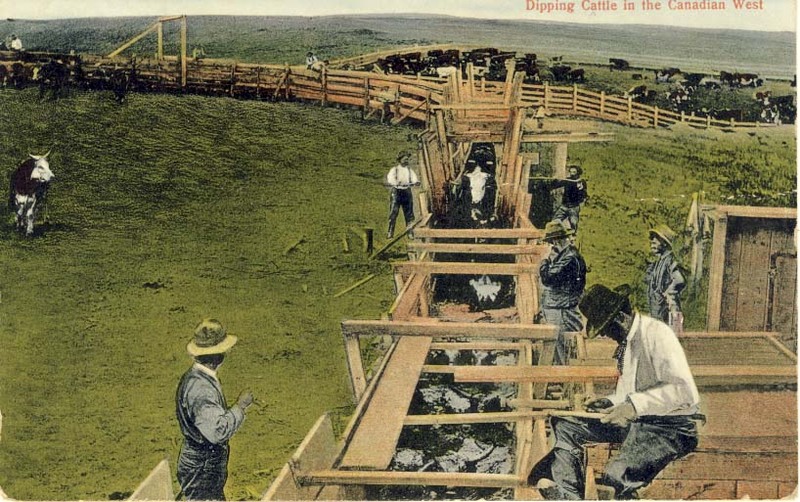 "Dipping cattle in the Canadian west." "Canadian West Series, no.3, 30 subjects." Clark, Kenneth S. The story of Colorado home, the original of 'Home on the range' / Kenneth S. Clark. Commentary with "Colorado home (prospector's song)." New York: Paull-Pioneer Music, 1934. Clark, William Russell. A stained glass window and other poems / William Russell Clark. Memphis, TN: Memphis Publishing Co., 1934. Clayton, Lawrence. "Elements of realism in the songs of the cowboy." In American Renaissance and American west. Edited by Christopher S. Durer ... et al. Laramie, WY: University of Wyoming, 1982. Clayton, Lawrence Ray. John A. Lomax's cowboy songs and other frontier ballads: a critical study / Lawrence Ray Clayton. Ann Arbor: University Microfilms, 1974. Texas Tech University: L. R. Clayton, 1974. PhD thesis. 416 leaves. Clifford, John. "Range ballads." Kansas Historical Quarterly. 21 [?25](8): 588-597, Winter 1955. * Clough, Wilson. We, borne along / Wilson Clough. Prairie City, IL: Decker Press, 1949. 53 p.
Clover, Sam T. The mounted muse and other cadences / Sam T. Clover. Los Angeles, CA: Saturday Night Publishing Co., 1928. 148 p.
Clyman, James (1792-1881). James Clyman, frontiersman / James Clyman. Edited by Charles L. Camp. Portland, OR: Champoeg Press, 1960. See: "Verses," p.244-260. * Coad, David. Gender trouble down under: Australian masculinities. [Paris]: Presses Universitaires de Valenciennes, 2002. 199 p.
* Coates, Grace Stone. Portulacas in the wheat / Grace Stone Coates. Caldwell, ID: Caxton Printers, 1932. 71 p. Inscribed to Mr & Mrs Thomas Ferril. Coburn, Wallace David. Rhymes from a roundup camp / Wallace David Coburn. Great Falls, MT: W.T. Ridgley Press, 1899. * Coburn, Wallace David. Rhymes from a round-up camp / Wallace David Coburn. Illustrated by Charles M. Russell. New edition, revised and enlarged. New York; London: G.P. Putnam's Sons (Knickerbocker Press), 1903. 137 p.
"Cowboys' kitchen, the chuck wagon, Western Canada." Cochran, Robert. Vance Randolph: an Ozark life / Robert. Cochran. Urbana, IL: University of Illinois Press, 1985. * Coffee in the gourd. Edited by J. Frank Dobie. Austin, TX: Texas Folk-Lore Society, 1935, c1923. 110 p. Reprint. (Publications of the Texas Folk-Lore Society, n.2). See: "One evening as I sat courting" / L.W. Payne, Jr.; "Miscellanary of Texas folk-lore" / W.P. Webb. Coffin, Raymond. Poetry for crazy cowboys and Zen monks / Raymond Coffin. Santa Barbara, CA: Ross-Erikson, 1980. 69 p.
Cohen, John; Seeger, Mike. The New Lost City Ramblers song book / John Cohen; Mike Seeger. New York: Oak Publications, 1964. Cohen, Norm; Cohen, Anne. "Folk and hillbilly music: further thoughts on their relation." John Edwards Memorial Foundation Quarterly (JEMF), 13: 50-57, 1977. Coldiron, Daisy Lemon. Songs of Oklahoma / Daisy Lemon Coldiron. Dallas, TX: Kaleidograph Press, 1935. Coleman, Rufus A. The golden west in story and verse / Rufus A. Coleman. New York: Harper & Brothers, 1932. * Coleman, Satis N.; Bregman, Adolph. Songs of American folks / Satis N Coleman; Adolph Bregman. Illustrated by Alanson Hewes. Freeport, NY: Books for Libraries Press, 1968, c1942. (Granger index reprint series). 128 p.
See: "Blood on the saddle," "Cowboy's Christmas ball," "Cowman's prayer," "Night-herding song," "Glory trail," p.35-50. * Colorado poets: an anthology of 50 contemporaries. Edited by Henry Harrison. Foreword by Nellie Burget Miller. New York: Harrison, 1935. 160 p.